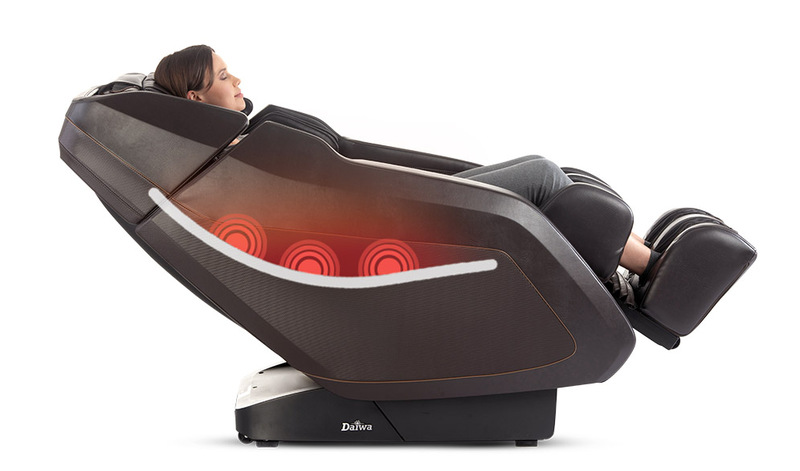 Olympia is a full-featured massage lounger that offers therapeutic treatments that keep you feeling your best. Targeted massage rollers apply traditional massage techniques to the back, shoulders, and hips. Extra-long L-shaped massage track runs from the shoulders to the hamstrings for a full-body treatment. Our chair is built extra-wide to fit many users from 4’8” – 6’6.” With advanced features and an easy-to-use remote control, Olympia is the best value for a high-end massage chair that will leave you feeling relaxed, refreshed, and revived. The Daiwa Olympia features an  extra-long, L-Shaped Massage Track that runs from the top of the shoulders to the bottom of the hamstrings. 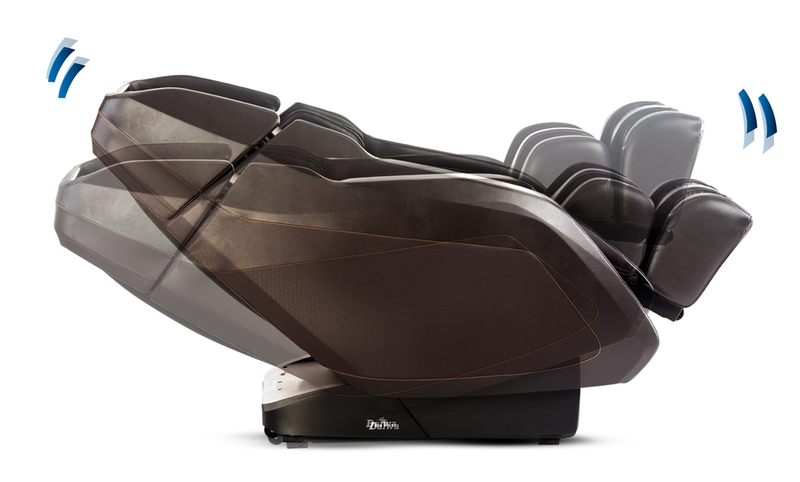 Unlike most other luxury massage chairs, whose S-Shaped Massage Track limits reach to the backrest only, the Daiwa Olympia offers a supreme full-body massage experience. Before beginning any massage session, Body Scan technology maps your entire back in order to provide a custom massage that is contoured to the unique curvature of your spine. The therapeutic heat feature gently warms the lumbar (lower back) region to maximize the effect of the massage, helping to ease tension, reduce stress, and alleviate muscle stiffness and soreness. The Olympia gently rocks back and forth to generate the feel of a classic rocking chair. Rocking Rotation Technology reduces sleep anxiety and stress. You can enjoy this feature in our Extend and Relax automatic programs. The Zero-Gravity Recline shifts the angle to one of two positions, evenly distributing body weight and reducing pressure on joints and organs. You'll experience a floating sensation that over time reduces chronic pain. Built into the chair are 40 Airbags that rhythmically inflate and deflate during your massage session. These airbags gently stretch muscles to melt tension, improve circulation, and ease body fatigue. Airbags are located on the shoulders, around the arms, around the hips and even under the thighs and calves in order to apply a full-body stretch. Airbags surrounding the feet inflate and deflate to mimic the alternating compression technique of a live massage. Drawing upon the principles of reflexology, our foot rollers stimulate nerve endings on the feet to relieve tension, improve circulation, and renew vitality throughout the entire body. Two distinct foot rollers target specific areas of the feet. The optional soft foot pads soften the effect for a gentler foot massage. The extending foot and calf massage unit slides out up to 5.5 inches, ensuring a tailored leg massage to users of any height. The Olympia comes with a removable chair pad. The 3/4 inch thick soft chair pad (either Black or Choco color to match your chair) allows you to enjoy these beneficial reclining postures without a massage treatment. Talk on the phone, watch TV, or play video games while enjoying the therapeutic benefits of zero gravity inversion. 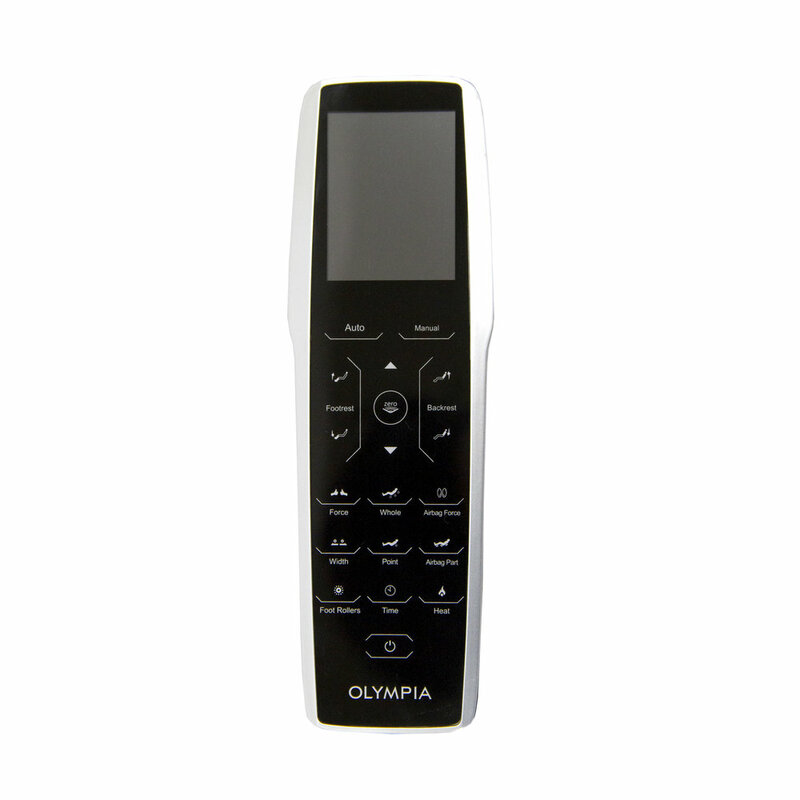 The Olympia uses advanced technology and therapeutic features to deliver unsurpassed full-body massage therapy. The Olympia features a roomy interior to fit many body types. Choose from 18 auto programs or 6 customizable manual programs with the easy-to-operate hand held remote. A convenient pocket keeps your controller secure and in reach. This Olympia is upholstered in smooth Carbon Fiber material encapsulated in a soft flexible coating with the feel of leather. This feature makes the switch between massage programs smooth and seamless. It eliminates interruptions while navigating program options, and prevents short-circuit or overheating damage.